Harper by Andrea Arcello Limited Edition 852/1000 Length: Approximately 20 inches Weight: Approximately 6 pounds Medium brown hair Lausher grey blue eyes Full arms Full legs Jointed micro-suede body. Harper is a handsome little guy and highly sought after sculpt by Master Sculptor Andrea Arcello. I spent many hours painting very fine layer upon very fine layer using non-toxic Genesis Heat Set Paints. I mix my own colors and take extra care to match skin tones with the hair and eye color. The nostrils have been shaded to add depth and are not open. The paint has been sealed with a matt varnish which is baked on so his beauty will last for many generations. 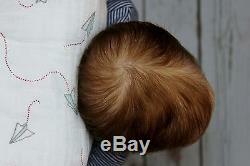 Harper's medium brown hair has been meticulously hand rooted one or two strands at a time. After rooting his hair, I sealed it from the inside of the head with a waterproof sealant. The eyebrows were painted to match the hair color. He has both rooted and applied eyelashes because I liked the effect on him. Harper's eyes are a beautiful grey blue color and are full round mouth blown from Lausher Germany. These are some of the most realistic eyes I've ever seen! Harper has full jointed arms and full jointed, front loading legs. The vinyl is very soft and pliable. His body is flesh tone micro-suede and is jointed with standard non-pop joints. Both the arms and legs are jointed for easy movement and posing. The limbs arm weighted with tiny glass beads and topped off with fiber fill. The body has been weighted with enclosed tiny glass beads surrounded with premium fiberfill. He is very soft and cuddly. He weighs slightly less than 6 pounds and wears size newborn baby clothes. For consideration of people with pacemakers, there are no magnets in this baby. I will add one upon request. 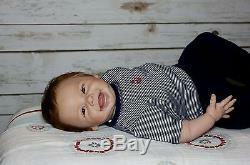 Harper will arrive with all of the clothing he is wearing in the photos. 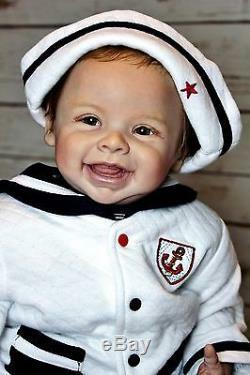 This includes a sleeveless white bodysuit, a baseball style romper, a striped bodysuit with matching navy blue pants, a white sailor hat and matching jacket, and a navy blue pair of socks. Also included is a lovely signed adoption certificate with silver foil embossed fleur de lis border and a numbered COA. Any other items seen in photos are not included. A Little About the Artist. I have loved dolls and art my entire life. As a child I spent a lot of time with my grandmother who was an avid doll collector. She began collecting around the time I was born so I grew up in the doll world. When I stumbled across reborn dolls back in 2008 it was love at first sight and I knew that I must learn this skill! My art dolls now reside in several countries around the world and my hope is that you will enjoy them a least half as much as I enjoy creating them for you! This doll is not a toy but a three dimensional work of art, therefore I strongly recommend not giving it to a child. If taken care of properly, he will be an heirloom for many generations to come. All of my art dolls come from a smoke free environment. I do not have any fur babies, only a parrot, and he isn't allowed to play dolls, (although I can't guarantee he hasn't snuck in a kiss or two)! This template and all of the photos are the sole property of Nearly Real Babies and may not be copied, downloaded or used for any purpose without WRITTEN CONSENT. The item "Reborn Baby Doll Harper by Andrea Arcello LE 852/1000 Lauscher Glass Eyes" is in sale since Tuesday, June 27, 2017. 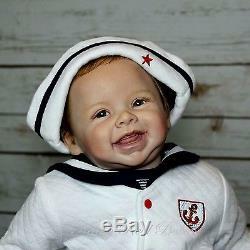 This item is in the category "Dolls & Bears\Dolls\Reborn\Reborn Dolls".babies" and is located in Mountain Home, Arkansas. This item can be shipped to United States.